What what? 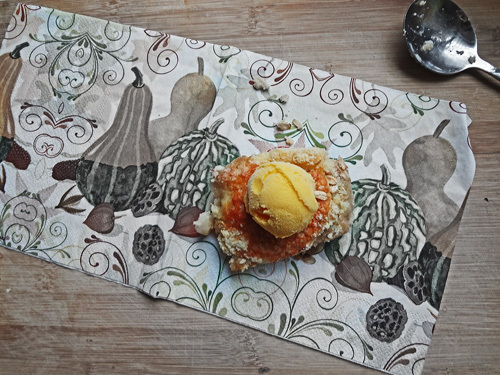 a cobbler and a crumble together? 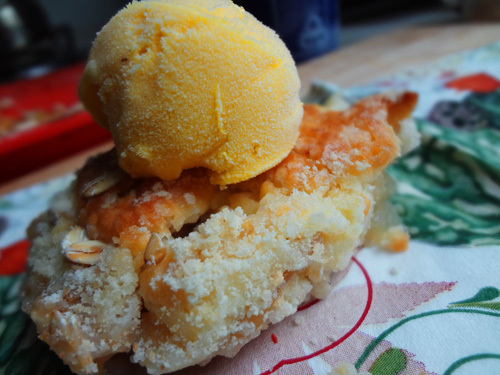 Yes indeed.. for why just have a cobbler when you can also have a crumble and vice versa. This idea happened not because I was feeling very inventive, well maybe I was.. I was greedy and the fat juicy apples sitting in front of me asked me how they’d like to be cooked.. now I’m just hallucinating. Actually I initially wanted to make a crumble but midway I started making a cobbler and then came back to crumble.. I’m confused that ways. But seriously, once you’ve had this divinity, you’d probably end up making this all the time. Out of habit I always make a lot of crumble topping and freeze it for instant crumbles, so of course I had the crumble ready.. you never know there might be a surplus of fruits and you’d want to top them with crumble.. Be prepared in life I say. Okay, so this is how I went with it.. I know, I know.. I couldn’t resist another picture of the gorgeousness that was this crumble cobbler or vice versa.. yes it’s an ice cream atop that.. Yes it’s winters, and yes its French vanilla ice cream.. thank you. These are 3 apples. Peeled, cored and sliced. Use whichever ones you want. 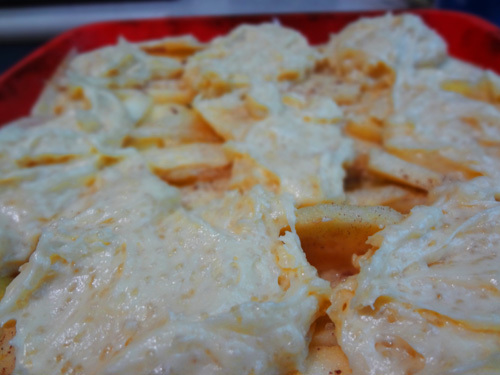 In your baking dish try to pile them evenly.. I did say TRY !! Set the apples aside and start with the crumble topping. I have flour and salt (mixed), sugar, baking powder, butter, egg and vanilla. Sift together the dry ingredients and in a separate bowl melt the butter, add the vanilla, and bet in the egg.. so basically a bowl of dry ingredients and a bowl of wet ingredients. Mix in the dry ingredients into the wet one or vice versa. and mix till all’s well mixed. It’ll be a thickish batter. If your batter doesn’t get to a dropping consistency then add 1 tablespoon of milk. Spoon the batter over the apples. I spooned over the batter in 9 uneven albeit somewhat pretty dollops. Don’t laugh. Here’s the crumble part. I added a bit of rolled oats to the crumble. As I said I had this crumble ready in the freezer for any passing fruit might need it..
Now sprinkle the crumble over the exposed apple parts. Honestly I didn’t mean for it to sound dirty. 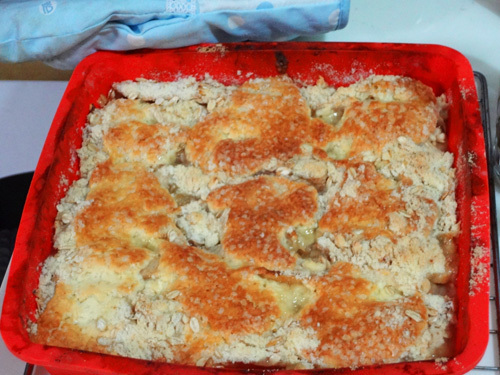 Sprinkle the crumble over the non cobbler parts and bake @ 180℃ for 20-25 minutes. 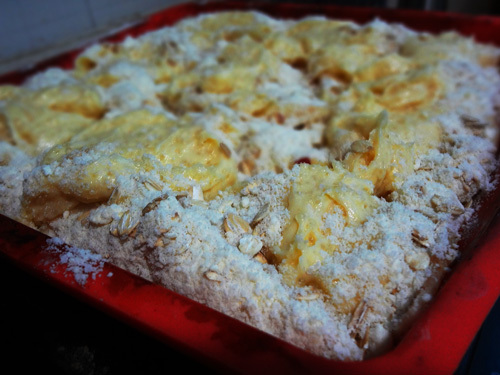 the baked result.. Let it cool a bit. Cut a generous slice, top with vanilla ice cream and please eat it already.. Le another picture.. ok no more.. Enjoy !!! 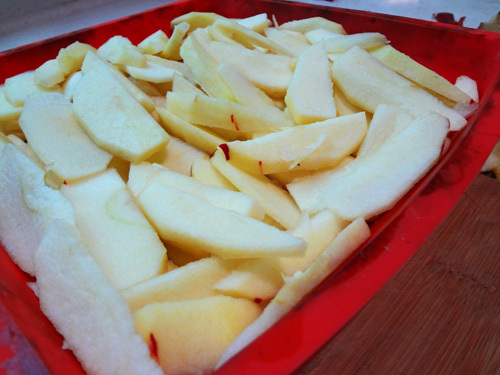 Peel core and slice the apples and line into your baking tray. Try to make them even. Sprinkle the sugar and cinnamon and set aside. For the cobbler, mix all the dry ingredients into a bowl. 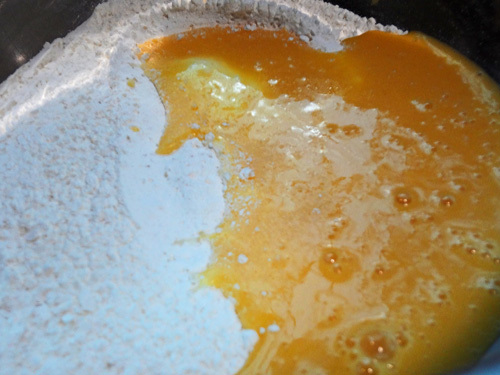 In a separate bowl mix the melted cooled butter with the vanilla and egg and mix. Add the wet ingredients to the dry and form a batter. If the batter is too thick add in 1 tbsp of milk. 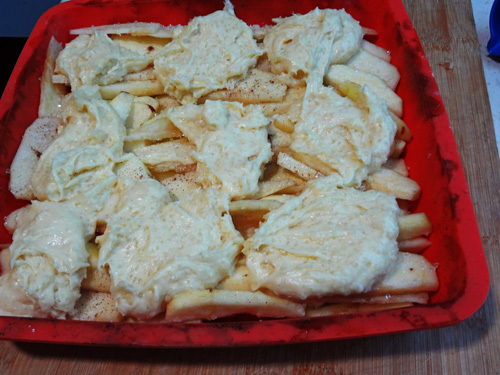 Spoon the batter over the apples. 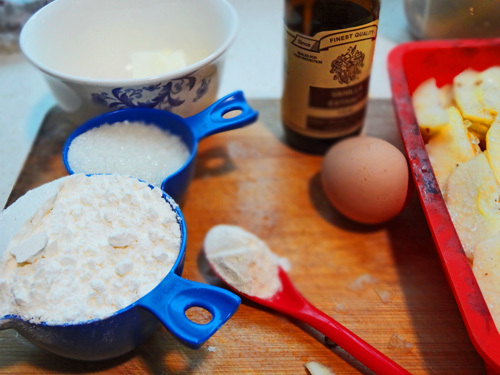 For the crumble sift together the flour,sugar, almond flour and baking powder. Cut the cold cubes of butter. You can either use a food processor, pastry cutter or simply your fingers. 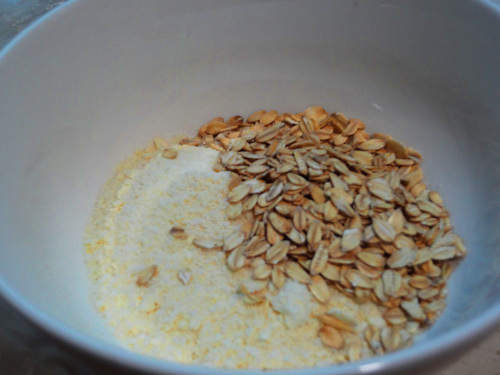 Once your mixture reaches a porridge like consistency add in the oats. Let there be clumps of butter since these will brown and give your crumble a burnished look. 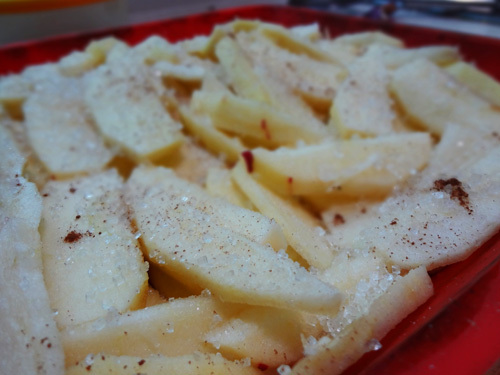 Sprinkle this crumble mixture over the apples which do not have any cobbler on them. 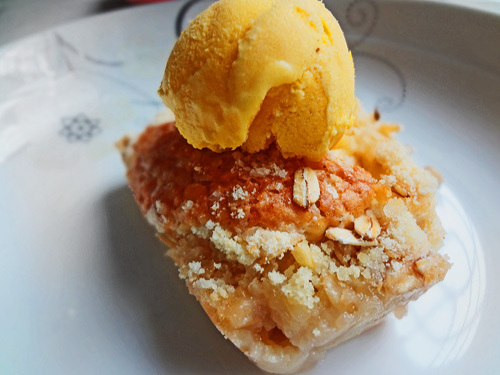 Make sure your apples are mostly covered with either cobbler batter or crumble mixture. 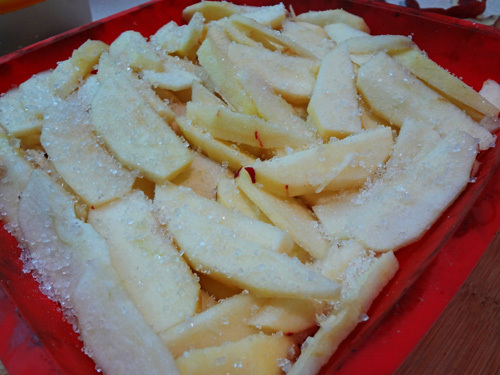 Freeze the remaining crumble mixture and use them as and when needed..
Bake 180℃ for 20-25 minutes.